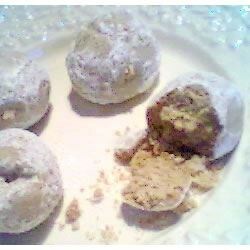 "A delicious peanut butter ball, baked and rolled in powdered sugar." In a medium bowl, cream the butter, peanut butter and sugar together. Stir in vanilla and flour, mix well. Then stir in pecans. Cover dough and chill for 3 hours or overnight. Roll cookie dough into walnut sized balls and place them on an unprepared cookie sheet. Bake for 15 to 20 minutes in the preheated oven. Cool slightly, then roll in confectioners' sugar. Absolutely love. Made them, grabbed one, came back 5 minutes later and none were left. EVERYBODY IN MY HOUSE LOVES THEM! Even my lil bro who hates peanut butter! Sorry I did not like this recipe at all. More like a divinity to me.